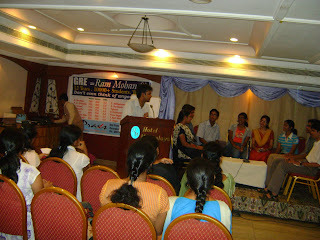 The BHARAT JHURANI Blog: Vizag trip - Genesis'08 rocked!!! A Small idea. A small Venture. It just crossed my mind one lazy evening, talking to a junior. The outcome: A decent scale event. Venue: a star hotel. Money involved: over Rs. 10,000. 40 odd participants. 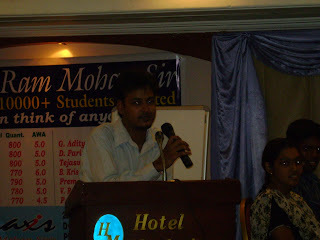 Vizag's best Verbal coach assisting me during the proceedings. A memorable evening. Iit all started one evening chatting to a junior, who was depressed with his CV for the upcoming placement season in his engineering college. Some more juniors ask me about this. and there i get this idea. Should i not return something back to the people i have been brought up amidst. A CV WORKSHOP. Spoke to my juniors to access the market need for the same. It was promising. Booked my flight tickets home, sacrificing the planned LEH-LADAKH trip. Reached home on tuesday evening itself, with the morning spent hopping malls in Delhi with someone special. Tuesday: Reach home at about 8PM. At about 10, get out of home for a session with my cousins, and primarily with bro. Wednesday: Vinayak Chaturthi, the Ganesh god festival, so met up all relatives to fulfill that formalities asap. Jatin, My brother left for hyderabad to attend some technical festival on robotics in an engineering college there. Feel more crippled. Now who is going to help me out with all the niceties. I am alone. Went out for a session with one of my cousins, and one other common friend. Drank with glory till the wee hours of morning, making the drinks atop a car, and driving crazy all the way to the new hills near GITAM. The venue for the upcoming software companies. Thursday: Did all the groundwork for the workshop. Went about working for my PAN cad, and other official work. Set up appointments with possible stakeholders. Friday: Went down to GITAM, to access the need and spread across the word informally. Also, to setup a team of people among juniors who could help me. Teachers day, so even they were happy seeing me, and was a day well spent. Ended the day with madu frens at Sandy lane, drinking away to glory. Saturday: Lotsa work to do today. Nothing concrete has been happening on the workshop front. Went ahead with booking of the hotel venue. Thought TIME would help me out with it, at least sponsoring the venue, but to no avail. Daspalla is booked and TIME raises tis hand from this venture. Booked Meghalaya instead - my venue for the workshop. Went down to Career Launcher giving them a proposal of sponsoring the event, or at least using it for their publicity. Abdullah sir is really admirable. his business acumen and the person himself have a charm of their own. My first sponsorship, with the money coming in immediately. Printed the posters and the receipt tickets. Yes, now i can start off. The day was really good. Manage on more sponsorship from Praxis. Went pub hoppinng in the night along with iruag and her friends. We first went down to The Park for a beachside party, where we even got clicked for the newspaper. And then hopped down to Chrome( a pub with the name of the new google web browser, one am using right now). Sunday: My friend and junior, Abhishek, who has been helping me out from the beginning, was the one who woke me up with lots of pain that morning. i am dead in slumber. He calls Jatin, asks him to call up home and get me awake. Have to go to TIME AIMCAT Venue for marketing. We did. It was a lukewarm response, and i further built up contacts there. Identified a junior, and neighbour, Radhika, who was entrusted upon with the duty of selling a ticket booklet. Inn the evening went down to an SIBM event, with the same TG. Triued some marketing there. Monday: Jatin is back from Hyderabad. 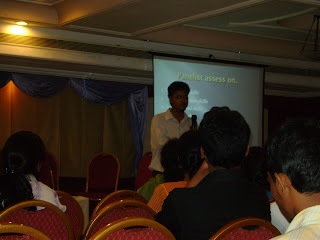 I spend the whole day in GITAM, going to various departments, to various classes marketing the workshop. I even went to the management college, with the help of Naidu, for further marketing. In the evening, i went down to TIME to market in their classrooms. It was overall a decent response. Tuesday: THE D DAY. Am tensed form morning. Y?? I dunno. I start off for some more sponsors. I get updates from my team that not many passes have been sold. The event could be a total flop. After all the motivation shots from Nisha, Ahen, Mom, etc.. pull up a strong face, and start getting prepared. "Nothing is going to happen. I AM THE BEST." Theses words keep echoing in my head. And anyways, maximum what may happen? I may just end up loosing some money. Big Deal?.. nah. It was a wonderful learning experience. I have a pint beer in a can, as suggested by Ahen, for good Luck. The workshop begins sharp at 6PM, as promised. We have decent turnout. Ram Mohan Sir joined me for the event, and it added to the confidence. A person from SDV News had also come down to cover the event. 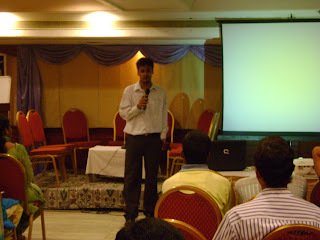 The CV gyan, Ram Mohan Sirs small speech on the does and dont's. Then the GDS, and critical inputs to each. Calling upon a random group to the stage and shooting it all for critical minute analysis. 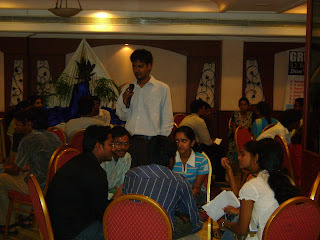 Then the interview gyan, and normal chat about CAT and best practices. 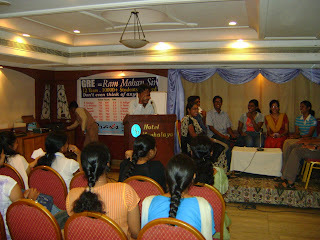 It was followed with a detailed question answer session, where i was assisted by Dinesh and Vamsi- My GITAM Friends. Jatin And Abhishek had been managing the logistics from the beginning, at the venue. 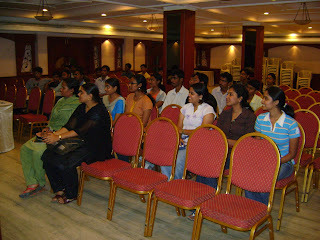 Overall, the session was a hit, and the participants went back a happy lot. The night demands party. All of us cousins go down to the terrace bar for a relaxed beer and chat. And then head to the bus station for some Hot idlis. It was one of the most satisfying drinks i have had. A memorable evening. 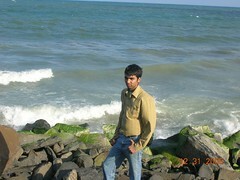 Wednesday: My last day In Vizag, for these holidays. Next trip would only be in march after completion of MBA. Met up akived at CCD, and then headed to the PAB card office for application. Afternoon i waned to see a telugu movie, a luxury not available in Lucknow. So went to Srinu from Srikakulam on Jatin's recommendation. Evening, me and Vamsi spend some quality time at YMCA, smoking away on deep thoughts.Went down to Ahen's house to pick up a parcel for her, and then head home. Dad, mom, Jatin and me, head down to Dhaba Express for dinner. After a real long time, all four of us were savouring a dinner together out in a hotel. It felt so good, spending quality time with family. After dinner i head down to Green park for a session with Sailesh, Abhishek, Goel, Siteesh and Jatin. A short session there and a long drive at the beach and some time in Naidu's room, i return back home to finish with the packing. Thursday: Flight at 11:40AM. Meet up everyone in Family. finish the last minute packing stuff, and set off to the airport. Away from vizag for another six months. My last leg in B-School. interesting..lotsa ppl think bout it..cool u did something !! It won’t be wrong to term Hyderabad as one of the most culturally rich places in India. Be it the legacy of the very famous Nawabs, the colorful streets, the exhilarating monuments or the mouthwatering and delicious Hyderabadi food, especially Hyderabadi Biriyani, this south Indian city has always been a hot shot tourist destination. The industrial and infrastructural development in this city in the recent years has only been the icing on the cake. Today the hotels in Hyderabad not only cater to the tourists but also to the business and corporate traveler. There are many business hotels in Hyderabad that are being dished out by the leading names of the Indian hospitality industry. Apart from the budget hotels in Hyderabad, luxury hotels are also abundant in the city. In short be it for work or an existing vacation, hotels catering to each class can be found in the city. With so much happening in this future metro, Hyderabad is actually the place to be! The coins will held in your account, and you can convert them to Bitcoins or USD.